Tootsie Time: Fertilizer Friday~~~ Flaunt Your Flowers!!! 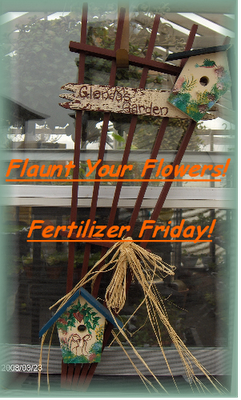 Fertilizer Friday~~~ Flaunt Your Flowers!!! Wooo Hoo!!! It's Friday!! Fertilizer Friday!!! Grab your fertilizer and hit that garden...give those plants a kick in the roots!!! When we are all done the feeding of the flowers...snap a few pictures and link up to Flaunt Your Flowers for Fertilizer Friday!!! Don't forget to take the FF Photo!! Before we get started...I would like to thank you all for the sweet comments about my abscessed tooth. I was feeling a lot under the weather and in a huge amount of pain...I am no longer going back to the hospital every 12 hours for IV drugs...I am on an oral prescription now and will be having this tooth removed when the infection is all gone...the appt. is for the 6th of July. My Peony is blooming! The one in the front is not yet. I thought this pot was garbage!!! seems to be catching nicely! Okay...your turn. Link up and show us what you have blooming! I always find great ideas in your gardens!! !